That’s a pretty garish cover isn’t it, I think I prefer the audiobook, below. I listened to it at work, didn’t make any notes, then found the paper version in one of my three local libraries (Victoria Park, WA). Wind/Pinball (2015), containing Murakami’s first two published novels from 1979 and 1980, is a book in three parts. Murakami was born in 1949 so he wrote the novels when he was 30,31. They are not autobiographical – though I imagine he was writing about experiences and situations that were familiar – and are strictly realist, unlike 1Q84 and After Dark (review), the only others of his that I have read. Murakami married while he was still at university and he and his wife opened a small jazz bar in the student district of Tokyo, before graduating, to avoid having to take office jobs in the City. After five years of working day and night to pay off loans, a baseball game inspired him, he says, to become a writer. He dashed off a novel late at night using a pen and ink (for the Japanese characters) and hated it. Since I was born in Japan, the vocabulary and patterns of the Japanese language had filled the system that was me to bursting, like a barn crammed with livestock. When I sought to put my thoughts and feelings into words, those animals began to mill about and the system crashed. Then I sat down and “translated” the chapter or so that I had written in English into Japanese. Well “transplanted” might be more accurate, since it wasn’t a direct verbatim translation. In the process, inevitably, a new style of Japanese emerged. The style that would be mine. The resulting novel, Hear the Wind Sing – almost a novella he says (it’s only 100pp) – was a success. He immediately wrote a sequel, Pinball, 1973, and these two, written on his kitchen table, with his next, and first full-length novel, Wild Sheep Chase, form the Trilogy of the Rat. An unnamed narrator and his rich friend, Rat, twenty-something young men, drink in J’s Bar (J, who is older and Chinese, is the bartender) somewhere on the coast, not Tokyo. Interestingly all the cultural references are Western – Hitler, JFK, Flaubert, Mozart, Brook Benton and so on. The narrator wakes up naked, in bed with a naked young woman. They do not know each other. She interrogates him. He found her unconscious in the toilets in J’s bar, patched her up, brought her home. He didn’t sleep with her. She doesn’t believe him. There are lots of short chapters. Scenes in the bar. Segments of a DJ on the radio, playing the Beach Boys. The narrator is fascinated by the (fictitious) author Derek Hartfield. He goes into a record shop and the young woman is there behind the counter. He buys The Beach Boys, Beethoven and Glenn Gould. The young woman finally works out for herself that nothing happened, gets his number from J’s Bar and phones him, they start going out. Life goes on. He moves away, to Tokyo. The young woman has moved on. The Rat is writing novels. “California Girls still sits in the corner of my shelf”. The narrator is living with identical twin girls. They have adopted him, moved in without even a change of clothes, he doesn’t know their names, they tell him to choose, calls them 208 and 209, the numbers on their T-shirts. He is partner in a translation business, pays them pocket money for housekeeping and so on. Many times I came home after work to see the sweatshirts with the numbers 208 and 209 fluttering in my south-facing window. Occasionally, it brought tears to my eyes. At college he had interviewed people about where they came from, become fascinated by Naoko who came from the country, a village with a bus stop, a few shops, and “there’s always a dog walking the platform from one end to the other. That kind of station”. No not fascinated by Naoko, by the dog. He has to see that dog. The pinball machine sidles in later. He becomes expert, the record holder, on a rare three flipper machine, the ‘Spaceship’. When it’s taken away during renovations he has to track it down. He and his business partner have an attractive receptionist who makes advances to him which he ignores. The Rat has a girlfriend who sold him a typewriter. This time it is the Rat who moves away. The twins move away too, going home they say. Melanie at Grab The Lapels insists I should always answer the question ‘did I like the book?’ I loved it! As far as I’m concerned, Murakami is up there with William Gibson, and in my book that’s high praise indeed. Haruki Murakami, Wind/Pinball: two novels, Borzoi, New York, 2015. Originally published in Japanese in 1979 and 1980. Audio version, Random House Audio, read by Kirby Heyborne, 2015. Haruki Murakami (1949 – ) is Japan’s “best-known novelist abroad”. I came to him late, borrowing an audio book version of 1Q84 from my local library one or two years ago. The opportunity to read this one came up when I saw our house in the Rue de la Tombe Issoire had a shelf of English language Murakami’s, selected this one as the shortest, and knocked it off in one night (that is, I read it, I didn’t take it with me). But I’ll have to make room in my posting schedule to fit it in. 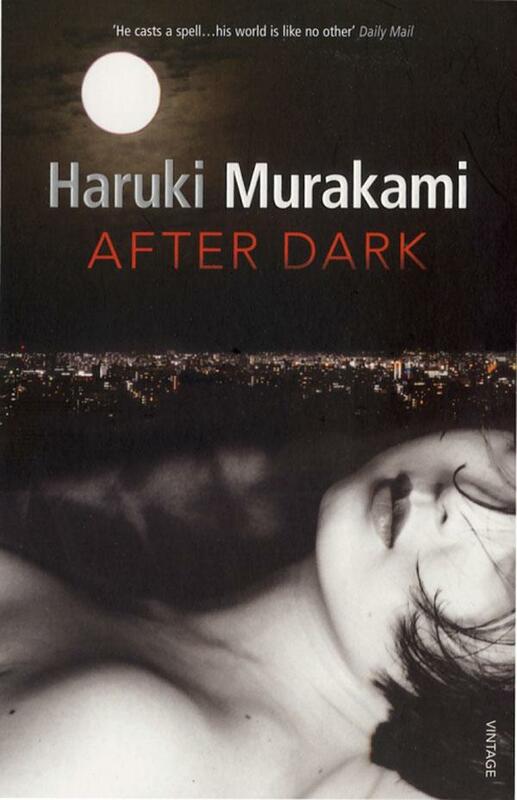 After Dark (2004) is both short – 200pp – and unlike 1Q84, relatively straightforward, but still with elements that occupy the space between SF and magic realism. A young woman is sitting in a cafe, a Dennys, late at night, reading. She is probably college freshman age, though an air of high school still clings to her. Hair black, short, and straight. Little make-up, no jewellery. Small, slender face. Black-rimmed glasses. Every now and then, an earnest wrinkle forms between her brows. She’s pretty, but we learn that she doesn’t think so herself. A lanky, young man with long, tangled hair comes in and, after a minute, joins her at her table. It appears that he has met her before, on a sort of date with her spectacularly good looking older sister. The name of the young woman is Mari, and her sister is Eri. It is only later that we discover the young man’s name, Takahashi. Takahashi leaves. He’s a trombonist in a band having an all-night practice session in a near-by warehouse. Later, a big, athletic woman, Kaoru, comes in, a former wrestler now managing a love hotel. A Chinese prostitute has been beaten and abandoned. Takahashi who sometimes helps out at the love hotel, has told Kaoru that Mari speaks Chinese. Mari goes off with Kaoru. Murakami’s voice alternates between narration and observation. The room is dark, but our eyes gradually adjust to the darkness. A woman lies in bed asleep. A young, beautiful woman: Mari’s sister, Eri. Eri Asai. We know this without having been told so by anyone… We allow ourselves to become a single point of view, and we observe her for a time. There is a television in the bedroom. The screen shows a seated man staring out into the room. Sometimes the screen flickers. Later in the book Eri’s bed is empty, the bedding undisturbed, but through the screen we see that, somewhere, she sleeps on. When she eventually wakes she seems unable to make her way back. With Mari translating, Kaoru and her workmates patch up the Chinese woman. Mari feels they might have been friends if circumstances weren’t dragging them in radically different directions. The Chinese woman is picked up by her minder on a motorbike. Throughout the night the bike cruises past Mari and Takahashi. They don’t notice. Mari talks to the women at the love hotel, to Takahashi who has cut short his rehearsal. Mari’s parents have concentrated all their attention on Eri and her modelling career, Mari is the ‘plain’, sporty one. She can’t go home, something is wrong with her sister, she, Eri won’t wake up. Takahashi has decided to give up music and concentrate on his studies to become a lawyer. We find that Eri has confided in Takahashi, who was in her year at school, but not in her circle. The night passes. Allowing ourselves to become pure point of view, we hang in midair over the city. What we see now is a gigantic metropolis waking up. Commuter trains of many colours move in all directions, transporting people from place to place. Each of those under transport is a human being with a different face and mind, and at the same time each is a nameless part of the collective entity. Mari finds a way to begin bridging the gap to Eri. After Dark is a good read, and just sufficiently weird to keep you intrigued. In the rue de la Tombe Issoire we are sitting up late, watching new episodes of Big Bang Theory on British TV. Geology daughter says “if it’s written by a man, with that cover” then she doesn’t want to read it. She’s right, Murakami is telling us women’s stories, of being in the beauty industry, of being a sister, so now I am unsure. You will have to decide for yourself.